Vicon announces launch of Valerus VMS 18.2. New to this release are features that include: automated NVR failover, enhanced configuration options that include an enhanced rules engine that can respond to external events, tighter controls for system access authorizations and network-wide log collection and reporting. 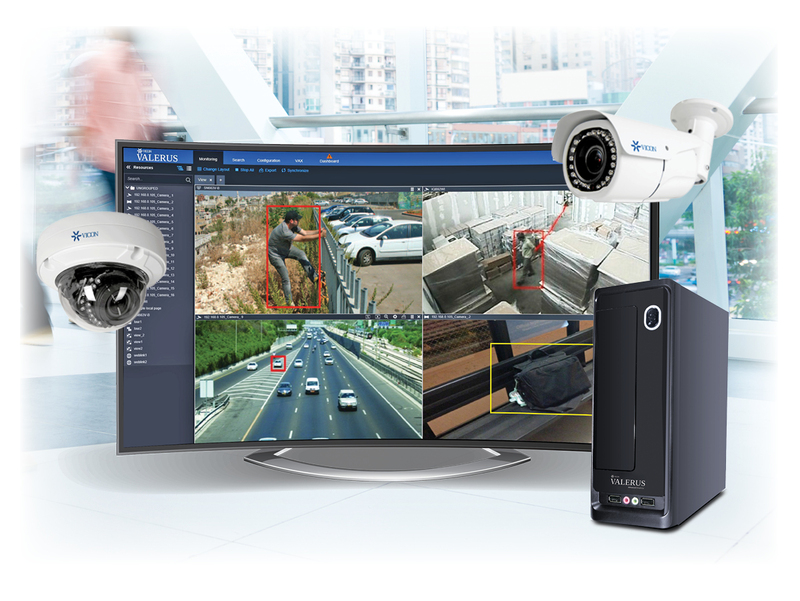 Vicon Industries, Inc. (OTCQB: VCON) (“Vicon”), designer and manufacturer of video surveillance and access control software, hardware and components, announced today the launch of Valerus 18.2, the latest version of its popular thin-client VMS solution built upon true open standards. New to this release are features that include: automated NVR failover, enhanced configuration options that include an enhanced rules engine that can respond to external events, tighter controls for system access authorizations and network-wide log collection and reporting. It also offers support for Valerus SmartAnalytics, a soon-to-be-released, tightly integrated video analytics solution that offers real-time event detection, video search and business intelligence applications. Valerus’ new NVR failover option allows administrators to create “failover clusters” within the network, in which one or more NVRs are identified as dedicated failover units to support primary NVRs. Failover NVRs automatically take over for primary NVRs within their cluster, maintaining all camera and system settings until the original NVR is restored to operation. Playback of recorded video remains seamless, eliminating the need for operators to know exactly when failover occurred. Valerus automatically retrieves video from the NVR on which it resides. The addition of Valerus SmartAnalytics as an option for users of Valerus 18.2 brings powerful, integrated analytics capabilities to the VMS platform. The Valerus SmartAnalytics engine applies detection rules based on sophisticated AI algorithms to provide live action alerts, post-event search and business intelligence trend analysis. Valerus SmartAnalytics can analyze video from multiple sources in parallel and allows for complex detection scenarios that link detection rules from different cameras. Unlimited combinations of analytics detection rules can be applied to each camera. Events and search tools appear within the Valerus interface, providing a simplified experience for system operators. Both NVR failover and Valerus SmartAnalytics support are offered through a new “enterprise” level Valerus licensing tier. The Valerus SmartAnalytics modules will be available to customers running Valerus Enterprise, version 18.2, beginning in early fall, 2018. Customers currently running Valerus Pro or Core level software can easily upgrade to Enterprise without the need for camera relicensing or hardware replacement. In keeping with the Valerus commitment to delivering “advanced simplicity,” Valerus 18.2 offers a simplified but more powerful system configuration user interface. Administrators can now use the Valerus rules engine to create multi-step automated actions in response to events generated by external systems. For example, an integrated LPR system’s identification of a black listed vehicle can prompt Valerus to immediately call up relevant cameras and send a text alert to specified operators, improving security staff’s situational awareness and ability to respond quickly. The configuration interface now simplifies load balancing, making it easier to move cameras between NVRs, and provides additional navigation buttons for jumping between the device and resource screens. Valerus 18.2 offers enhanced security through an updated authorization system. Administrators must now actively provide each user with access to Valerus resources by assigning him or her to one or more “roles”– Admin, Operator, Supervisor and/or Investigator. Assigned roles determine which resources are available to each user upon logging in. For support and maintenance teams, a single request can now provide system-wide software logs from all devices, making it easier to troubleshoot. Visit http://www.vicon-security.com/valerus182 to learn more about Valerus 18.2. The website also provides links for prospective customers to download a free trial version of the software and for existing Valerus users to download a free upgrade to version 18.2. For more information about Vicon, please visit: http://www.vicon-security.com. Vicon…Simple Solutions for a Complex World.